Yes, it's Santa, and Elf Greg. You won't want to miss the beautiful displays that are in every nook and cranny of this modest suburban home. Santa's are everywhere with magical elves, reindeer, penguins, snowmen, polar bears, trains, castles, toy soldiers, ferris wheels, carnival rides, baby Jesus in a manger, Christmas trees and lights bright enough to be seen from passing airplanes. Bring the family for a special treat that costs you nothing but brings much joy and delight thanks to a generous individual who took the time to share the Christmas spirit by providing such a wonderful experience for the community. 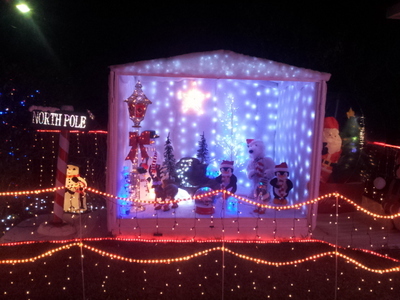 Thank you, Greg and your fabulous helpers for making Christmas special on the Gold Coast. Why? A magical Christmas experience. 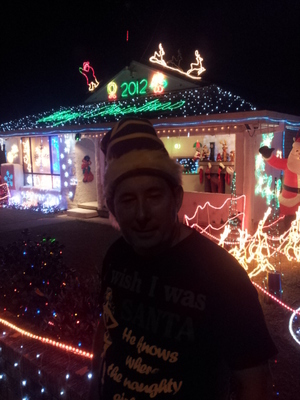 Hi Jacquelin, We visited last night, was great, thanks for the info and well done to Greg and his family, whose donation tin contents goes to Gold Coast Hospital Children's Ward. They made $1992.70 last year and have been raising since 2007. That's the real spirit of Christmas. Susan. My kids and I spent about an hour looking at all of the amazing displays in this yard a few nights ago. It was lovely chatting with the Hawkins, they are wonderful and generous people. The money and time commitments they give to make our Christmas a little brighter is outstanding. 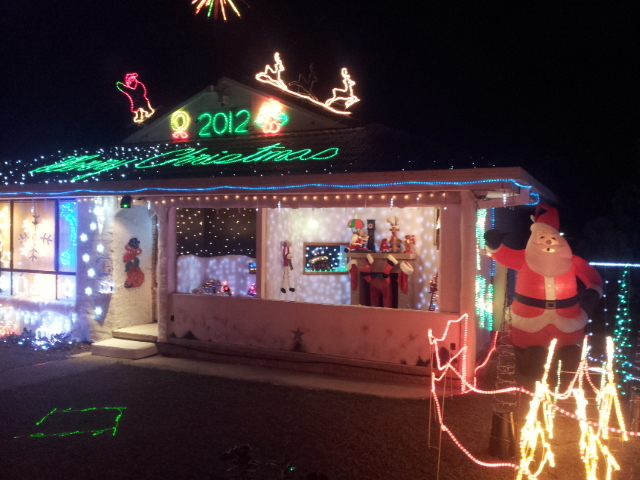 I want to give a big "Thank you" to Greg and his family, and to the other people who Light Up Christmas.